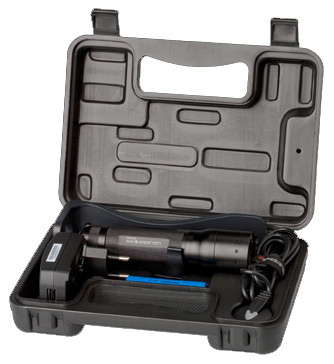 Introducing the LED Lenser M7R (8407-R) Micro Processor Rechargeable Torch, one of LED Lenser’s finest torches to date. The LED Lenser M7R is the rechargeable version of the M7 that we had a look at back in the beginning of May. It was not hard to see why the M7 was such a brilliant torch, I mean it was modelled from the P7, a revolutionary torch from LED Lenser that to many, has changed their day to day activities, and whether it was in the workplace or simply for a hobby, the P7 made a difference. Then came along the M7, an ingenious torch controlled by a micro processor which enabled the user to utilise a multi-mode switch with just one hand needed for full operation. The M7 on the other hand had one major drawback… batteries, four of them. We think it is fair to say that the same four AA batteries in the P7 would last much longer than in the M7. If you are constantly utilising the high lighting modes the M7 offers then forget about it, those batteries aren’t going to last you a third of the lifetime they could in the P7, because of the micro-processor drawing that extra power. Don’t get us wrong we think that the concept of the entire micro processor range from LED Lenser is brilliant, we just wish there was an alternative to constantly having to fork out for new batteries every couple of weeks (maybe even more if you are a really heavy user of this torch on highest lighting modes). So, what did LED Lenser do about it? They’ve given us the M7R and we think its just brilliant! This is probably the point where your asking yourself, sure the M7R sounds great, but why should I pay more than double what the M7 costs? Simple. If you were going to pay for the M7 then you are obviously expecting to have this quality torch for a long time, so take your expected lifetime of the M7 and add on the cost of four AA batteries every month (and seriously, this is for someone who doesn’t use the M7 much, which is a total shame! ), then lets say your four AA batteries cost you £5, so in the first year alone you are going to be paying an extra £60 for upkeep on the M7. This is practically the extra cost of the M7R covered in the first year alone! Remember, if you use the torch a lot on highest lighting settings you may as well treble the cost for batteries in a year, which actually makes one wonder, why on earth wouldn’t I pay just over double the cost of the M7! LED Lenser M7R, lets get serious about torches.